Are you looking for a salad that you can make on your day off and then eat all week? 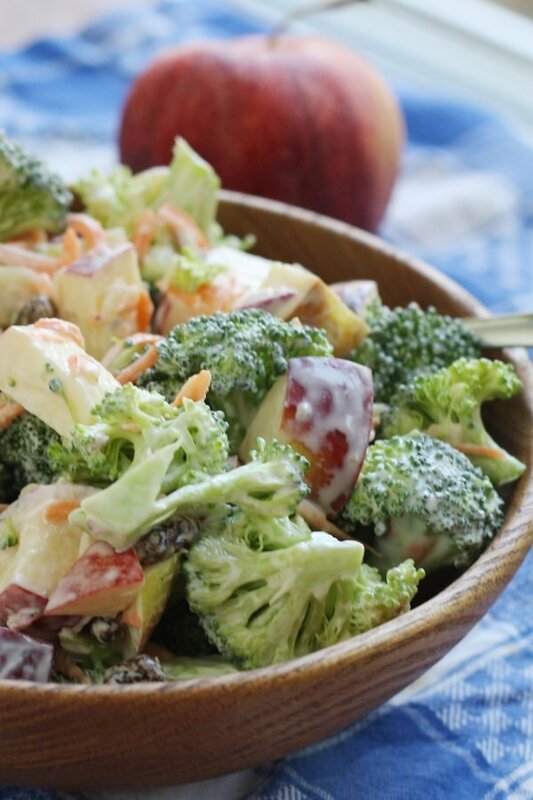 Look no further than this broccoli apple salad recipe. It can be difficult to keep a raw vegetable type of mixture ready to go for grabbing instead of – hmm, let’s say the cheesecake that my friend, Kate, brought over. Lettuce tends to melt in the fridge after you put a dressing on it and other salads that include parsley, basil, or avocado can become OLD very quickly. There is nothing as gross as an old salad. But, if you use heartier fruits and vegetables you can make LARGE salads that you can munch on all week. This salad uses broccoli, carrots, and apples and it is so yummy that my husband ate it instead of the cheesecake. The dressing is a combination of Greek yogurt and mayonnaise which I find tastes a bit better than only using yogurt. If you really love mayonnaise, you will find this lighter than your regular salad which is a good thing in the summer. I have been using Greek yogurt or plain yogurt in a few of my favorite salad recipes including Potato Salad made with Cauliflower and raw kale Caesar salad. It works brilliantly because it has a nice sour tang and a lovely creaminess for far fewer calories than mayo. 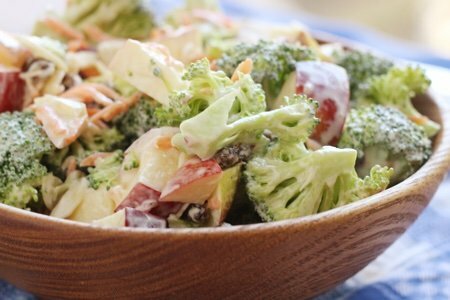 This broccoli apple salad is exactly the kind of food that I desire on a hot summer day – cool, crunchy, and good for me. I don’t understand people who can eat French fries when the sun is beating down and sweat is pouring down their backs. They seem so heavy. In the winter, my comfort food of choice is Poutine – a French Canadian specialty of French fries, gravy, and cheese curds. I don’t actually get to eat it very often which is probably a good thing (but I do dream about it for hours when it is snowing). Let me know what you think of this salad. I hope it becomes a staple in your house. In a large bowl mix together broccoli, carrot, onion, apple, and raisins. In a small bowl, whisk together yogurt, mayonnaise, and lemon juice. Pour dressing onto salad and adjust seasonings. Enjoy now or keep in the fridge for up to one week. So Delicious and healthfull! looking for best intuitive eating and health discussion. Hit my up! Cheers! I have been making a salad like this for years but It has morphed over time. Instead of the yogurt and mayo I use Marzetti LowFat Slaw dressing. Not all stores carry it'll but it only has 1.5 g of fat per serving and tastes as good as the original. I've added chopped nuts to it too. This looks like the salad of my dreams! I can't wait to make it. Love this salad! I throw in leftover chicken or turkey and some walnuts and make it a meal. @Morgan - about 8 ounces or one cup. Thanks for your question! Is that plain Greek yogurt ? @Berna - yes it is! Do you use reamayonaise or light? Can't wait to try this salad. Love this! I pulsed the broccoli, carrot and apple in the food processor to make it more of a slaw. Left out the raisins and added some crushed walnuts. Yum! Thanks for sharing the recipe. I would like a vegan option for this salad as I don't do dairy at all any more. Can I microwave the broccoli for a few minutes first if I am using frozen broccoli, or do you make it uncooked?